Grace Mugabe on graduation day. Former First Lady Grace Mugabe began studies at the University of Zimbabwe for her Masters in Social Studies a year before her application for post graduate admission was submitted, processed and accepted, the court heard yesterday. According to the prosecution, at all the relevant times, the registration process, application and the purported study by Mrs Mugabe was not known at the UZ's Faculty of Social Studies. Representing the prosecution, Messrs Tapiwa Godzi and Michael Chakandida submitted that suspended UZ Vice Chancellor Levi Nyagura, who is accused of illegally awarding Mrs Mugabe a PhD, presided over the whole processes that led to the conferment of the degree to the former First Lady. Mr Godzi said there was evidence showing that the whole process was riddled with irregularities. Nyagura on Tuesday through his lawyer, Advocate Sylvester Hashiti, filed an application for exception and quashing of an indictment on the basis that his hands were clean. 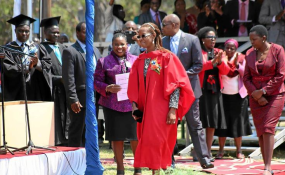 He said he was being wrongly charged, insisting that the latter's husband, former president Robert Mugabe, who was the varsity's chancellor, approved and conferred his wife with the PhD. He added that in his application, Nyagura attached documents which contained self-incriminating evidence. "The accused attached documents without applying proper mind to them because they contain incriminatory evidence," he said. "For instance, Grace Marufu made an application for post graduate admission on May 14, 2012 for MPhil Social Studies. On May 30, she was accepted and was to commence on March 1, 2012, what an inconsistent. This literally means that she was supposed to commence studies three months before her purported application and admission. "Also supervision notes by one Mararike shows that Grace Marufu was already undertaking studies as at March 2011, a year before the application, admission and registration." Nyagura in his application argued that the proper and responsible persons have not been brought to court. The prosecution responded to the submission saying: "The accused person presided over the whole process . . . he is also responsible for signing the degree certificates. "Further, no blame can be attributed to the chancellor(s). The Chancellor of UZ as provided for in the Act is completely ceremonial with no executive responsibilities. "By custom and practice, the Chancellor is not involved at any stage until the graduation ceremony where he makes a speech and caps graduates. "Successful completion of a PHD requires multiple procedures to be followed and tasks to be achieved yet the Chancellor is involved in none of all these, not even signing the degree certificate itself. "The charge is that the vice chancellor deliberately violated rules, regulations and practices of the University in awarding Grace Marufu a PhD which amounts to criminal abuse of office. "He further falsely and fraudulently recommended to the Council and Chancellor the conferment of the PhD." Acting Chief Magistrate Mr Munamato Mutevedzi presided over the case. He remanded the matter to April 9 for ruling.